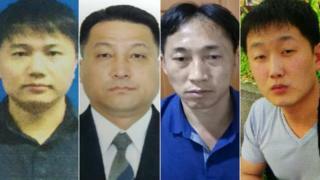 A senior police officer has told a trial in Malaysia that four North Korean men were involved in killing the half-brother of North Korea's leader, Kim Jong-un. Two women, from Indonesia and Vietnam, are standing trial for the murder of Kim Jong-nam. He died in February at Kuala Lumpur airport after highly toxic VX nerve agent was rubbed on his face. The women have pleaded not guilty and say they were tricked. They say they thought they were taking part in a TV prank. They face death by hanging if convicted. An investigating officer named four North Korean men in court on Monday, saying they had fled Malaysia after the murder. It is the first time they have been named in court, although their names had previously been known in connection with the investigation. CCTV footage of the men seen around the airport after the incident on the day of the murder was shown in court. They were seen changing their clothes before departing. They had entered Malaysia between late January and early February and three of the men left Kuala Lumpur for Jakarta, according to the main investigating officer, Wan Azirul Nizam Che Wan Aziz, but he added he could not recall the destination of the fourth. More CCTV footage showed some of the North Korean suspects meeting a North Korean embassy official and an official from the national airline Air Koryo at the airport's main terminal shortly after the attack.